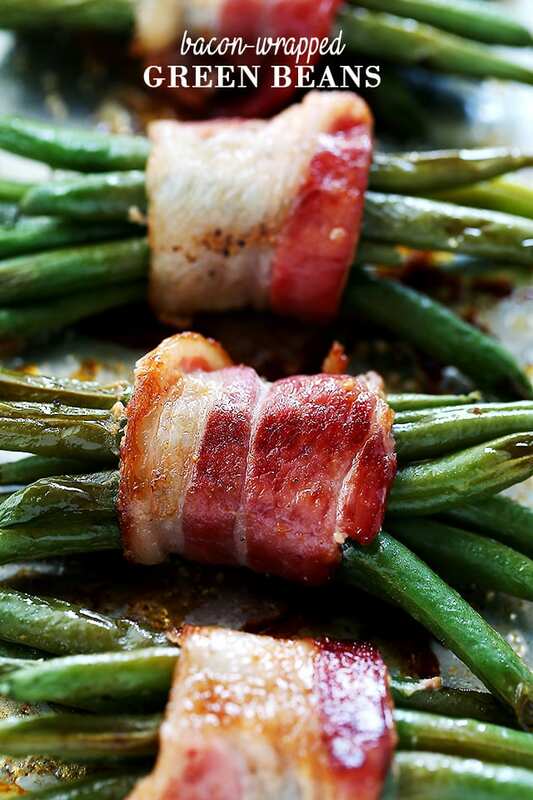 Bacon-Wrapped Green Beans – Roasted fresh green beans wrapped in bacon, sprinkled with brown sugar and a drizzle of balsamic vinegar. HI HI gorgeous! I’m talking to the bacon. If life was a food, every day would be a celebration because of you, you bacon you! Bacon Bacon Bacooooon! Friends, I am only here for a bit, taking just a little of your time to introduce you to how to eat green and healthy vegetables the right way; green beans meet bacon. Many of you, if not most, might have discovered this wonderful recipe already, but just in case you haven’t, and since NFL kickoff is TONIGHT (!!!! ), I thought this would be the perfect appetizer to start the football season. They’re SO easy to make, they’re SO delicious, and they’re gluten-free, nut-free, dairy-free, and egg-free!! I have you ALL covered! FYI! My very good friends are hosting a football party this weekend, and because their daughter suffers from severe food allergies, whatever I decide to bring has to be nut-free, dairy-free and egg-free. So, what dish could I possibly make that is allergen-free but so darn delicious? THESE Bacon-Wrapped Green Beans, of course. AND THESE! Meet your new favorite dessert: TURON! Otherwise known as Lumpiyang Saging, OR as we in ‘merica call ’em, Fried Banana Spring Rolls. Don’t you love them?! They are amazing! 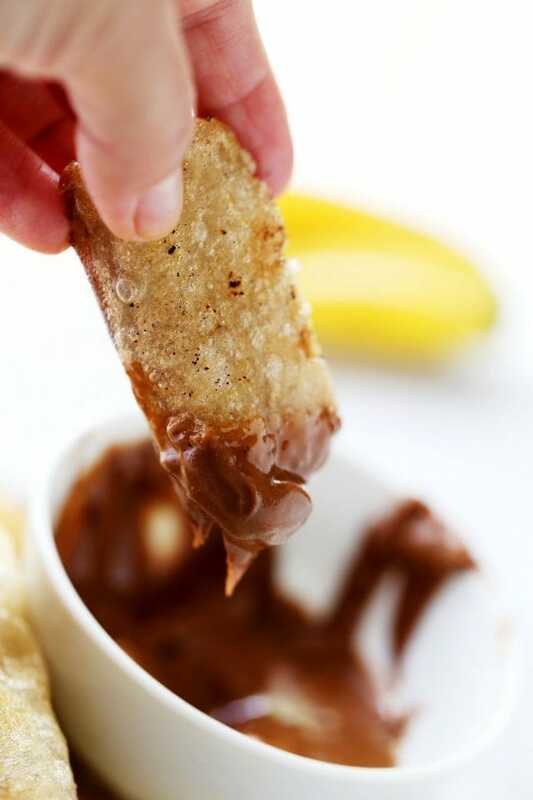 Crunchy and sweet, they are very simple to make (2 ingredients!!!!) and are also truly delicious. 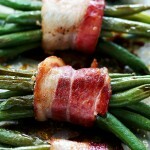 A delicious bundle of green beans wrapped in bacon and topped with brown sugar and balsamic vinegar. Lightly spray a baking sheet with baking spray and set aside. Place about 6 green beans on each halved bacon strip. 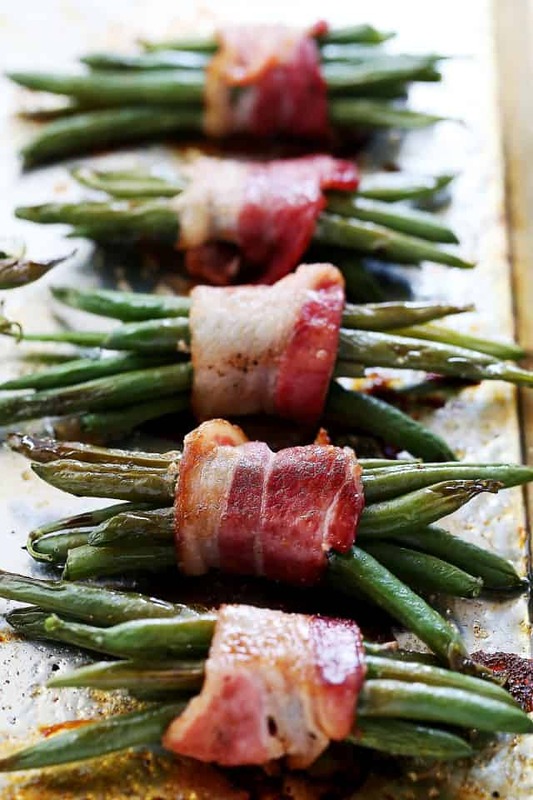 Wrap bacon around green beans and secure with a toothpick. Season each bundle with salt and pepper. Sprinkle each bundle with brown sugar. Drizzle each bundle with balsamic vinegar. Transfer to previously prepared baking sheet. Bake for 15 to 20 minutes, or until green beans are tender and bacon is crisp. I would like to make these got a dinner party but can’t see the actual recipe. How long to cook, etc. Heyya,, These look so nice! I cook my green beans with bacon, but you’ve taken it to a whole new, fancy level. Love it! These look so nice! I cook my green beans with bacon, but you’ve taken it to a whole new, fancy level. Love it! I need those bacon-wrapped green beans in my life — game day or not. They look amazing! Ummmmmmm. I will take some green beans with my bacon, please. Yay for football season! Pinned! I love this idea! Our motto here is bacon makes everything taste better. LOL In fact one year my father in law made every dish with bacon at Thanksgiving…my oldest son was SO happy! Definitely trying these! These beans look insanely delicious. You made my favorite veggie even better. Hello, snack time! They both sound totally amazing, you can never go wrong with bacon wrapped anything! I am so with you, I don’t know much about football but I love football food! These pictures are insane too, my friend! Oooh these look amazing! I don’t really follow football, but I definitely follow football food. Anything with bacon is a win in my book! You had me at bacon wrapped! These need to happen!! Yes please! These beans looks soooooooooo good! Who doesn’t love their food wrapped in bacon? Off to Sheknows now to salivate. I too name my bacon gorgeous. zing.